Ethan woke up that morning in a most cheerful mood indeed.Â Obviously memories of his birthday party the eveningÂ before were still fresh in his mind and he spent his morning playing with his balloons and other toys.Â We had a superb lunch at one of our favorite Korean-Chinese restaurants, Tong Soon Garden, andÂ we were pleased to see that Ethan had a HUGE appetite! 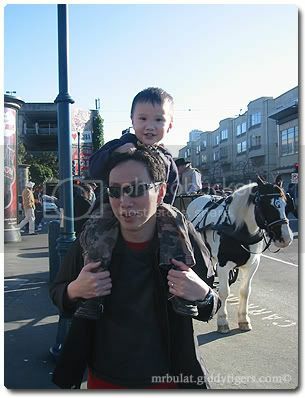 After lunch, weÂ took a drive up north to Pier 39 in San Francisco.Â The weather was beautiful!Â Sunny and warm and just nice for a nice stroll along the pier. 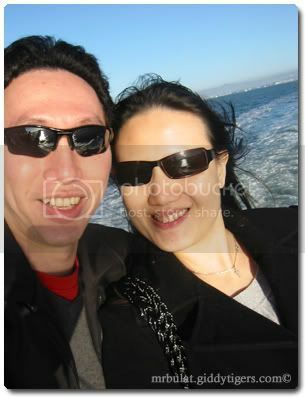 In fact, the weather was so amazing that we decided to go along with our plan to take the Bay Cruise on one of the ferry boats. 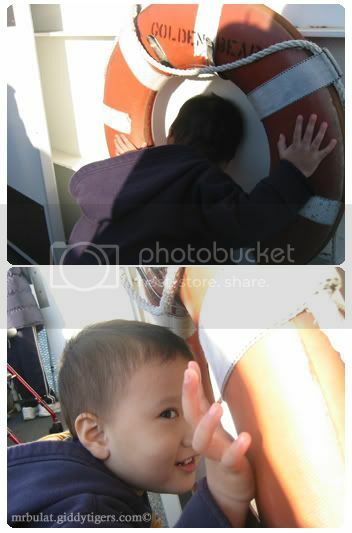 Ethan was overwhelmed with the excitement of getting onto a boat, and he certainly didn’t hide it. 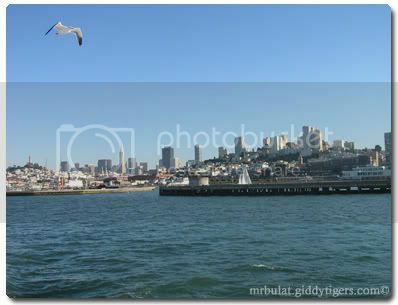 The ferry boat ride from Pier 39 was also a first for Pete and me.Â It was supposed to last 60 minutes, and included a ride around Alcatraz and also under the Golden Gate Bridge.Â Of course, additional bonuses included breathtaking views of San Francisco…and seagulls trying their best to catch up with the moving boat! Although the weather was nice and warm, it was VERY windy out in the open seas, but there was a certain sense of freedom that the wind brought. 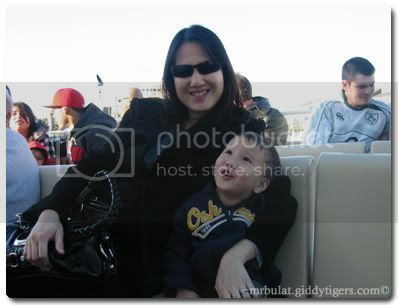 Most of the time it was tough getting Ethan to pose and smile for a nice picture.Â He was just too active and wanted to roam around the boat! 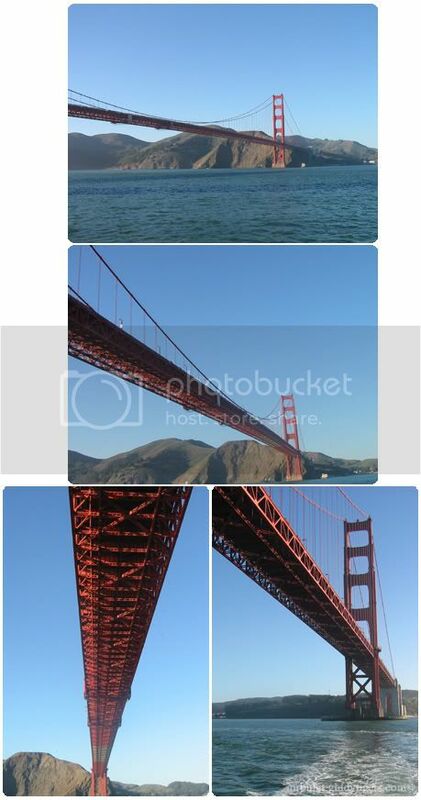 Then it was time for one of the highlights of the cruise…cruising under the Golden Gate Bridge.Â The view was magnificent for we had never seen the bridge from that angle before. …and he insisted that Pete and I imitate what he did! 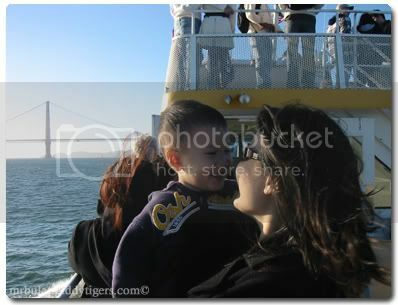 Well, we didn’t go on the cruise that included the Alcatraz tour, but our boat went close enough around the famous island. Ethan definitely enjoyed the entire cruise, and since the sun was out too, he had a chance to try on his new pair of sunnies, our birthday present to him! Don’t you think he looks way cool? 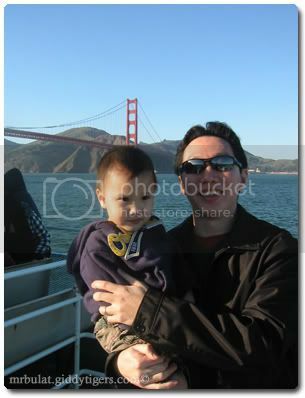 After the cruise, we took a leisurely stroll to look at the sealions (Ethan imitated the noise they madeÂ to the tee! 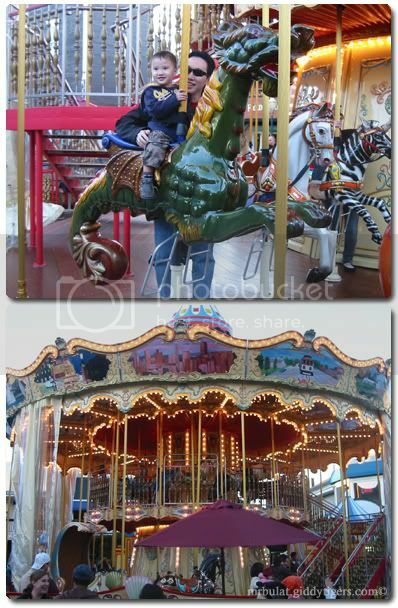 ), and then we walked by the many shops and stalls.Â But then suddenlyÂ Ethan caught sight of the merry-go-round! 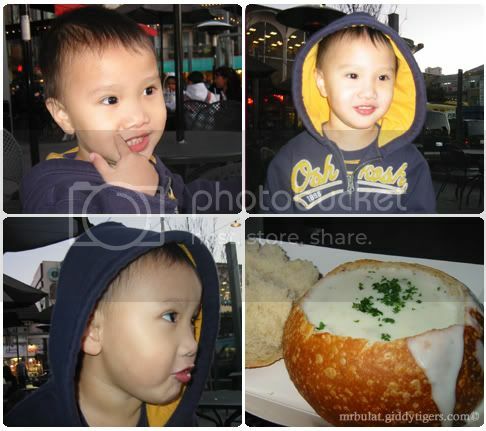 Our day out ended with the much craved-for clam chowder at Boudin.Â Ethan ate a LOT of my share, and he was even dancing to the romantic jazzy tunes that were being played in Fisherman’s Wharf.Â The birthday boy really had the time of his life, and was even reluctant to leave! It was a special day for Ethan and of course, an equally special day for Daddy and Mommy too!Â We love you loads, Ethan boy! You all sure had a great time with everything nicely packed for a day - good food, great company, a new adventure and fun, fun, fun! Joyce says: Yes, indeed we had a whole load of FUN! Happy Anniversary!! Looks like Ethan enjoyed the special day! Joyce says: Yes, of course he did! Joyce says: Hahahahaha…!!! You really made me laughed out loud with that comment! scenery so beautiful Happy Birthday Ethan.. 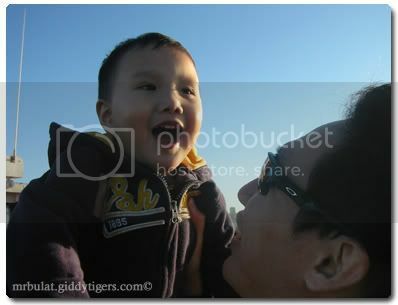 I love that candid shot too!